Benguet is home to Baguio City, the Summer Capital of the Philippines. However, there is more to that. 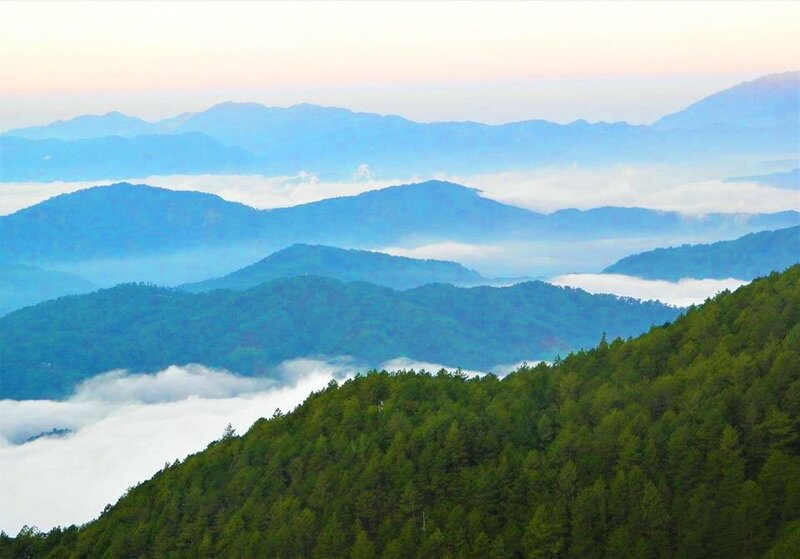 The vast and diverse natural landscapes of Benguet host some of the most scenic and fascinating sights in the country. I have created the following list of tourist spots in Benguet. Take note. Most of these are off-beaten. It is my hope that promoting these for ecotourism would lead into their protection and conservation. After all, many of these sites play integral roles in the economic and cultural lives of local communities. 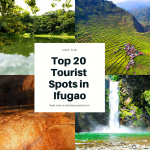 Without further ado, here are the top 20 tourist spots in Benguet. Rising to an estimated 2, 922 MASL, Mt. Pulag is the highest mountain in Luzon and the third highest in the Philippines. Vast groves of dwarf bamboo grasses cover its rolling summit. These shelter endangered species such as the cloud rat. The peak of Mt. 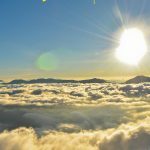 Pulag offers one of the best views of sunsets and sunrises. Stunning sea of cloud formations frequently appear as far as the eyes could see. Mossy forests also abound. Unfortunately, commercial gardens are slowly creeping, threatening the lush forests of Mt. Pulag. Hopefully, concerned government agencies, private sectors, and the community members would collaborate to come up with a masterplan that would ensure the sustainable management of the said mountain. By the way, Mt. 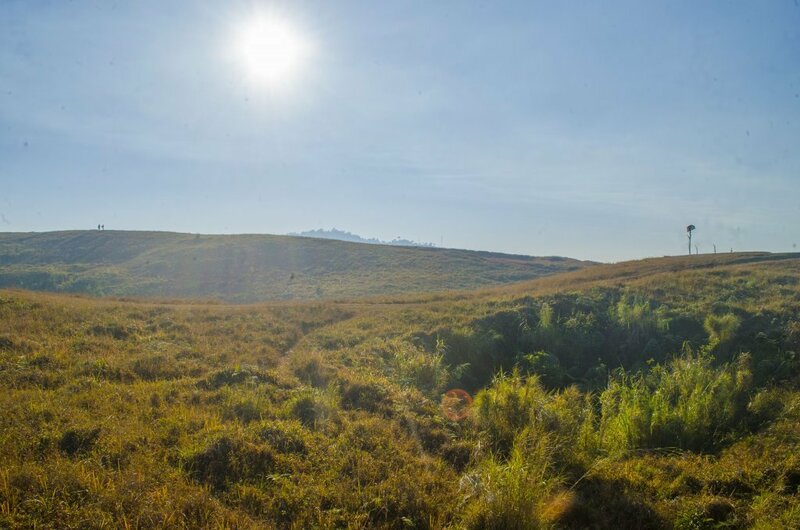 Pulag is one of the most visited tourist spots in Benguet. Mt. Yangbew dominates La Trinidad valley. It is perhaps one of the most accessible tourist spots in Benguet. The trailhead is at sitio Binat of barangay Tawang. This is just some minutes ride from La Trinidad center or Baguio City. From the trailhead, it takes another 20 to 30 minutes of hike to reach the summit. While atop, you can have a full view of La Trinidad and neighboring Baguio city. The towering peaks of Atok and Kabayan including Mt. Pulag are also visible here. Grasses and a few shrubs cover the summit of Mt. Yangbew, reminiscent of Mt. Pulag’s peak. Another interesting feature of the mountain is the presence of limestone rock formations. Just like other tourist spots in Benguet, this is a fragile ecosystem needing protection. This is just one of the countless waterfalls found in Bakun. Perhaps, this is also one of the most picturesque tourist spots of Benguet. From barangay Poblacion, it takes around 30 minutes of hike to get here. 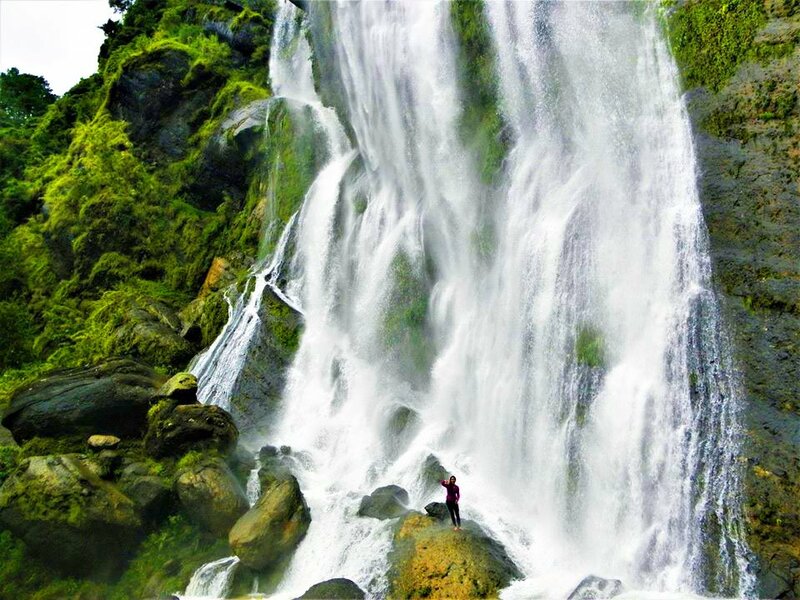 Along the way, you can have a glimpse of the stunning Tres Marias falls and the majestic Mt. Tenglawan, one of the trio-mountains of Bakun. Tekip Falls cascades like a giant curtain of water. It measures more than 80 feet high. It has small and shallow pools with icy-cold waters. 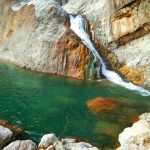 To really feel the rejuvenating effect of Tekip falls, it would be good to position yourself at its base while its cascades give you a massage. 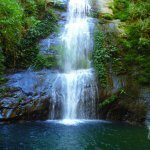 The best time to visit Tekip falls and other cascades of Bakun is during the rainy months of June to December. During these periods, the falls display their full strength and beauty. 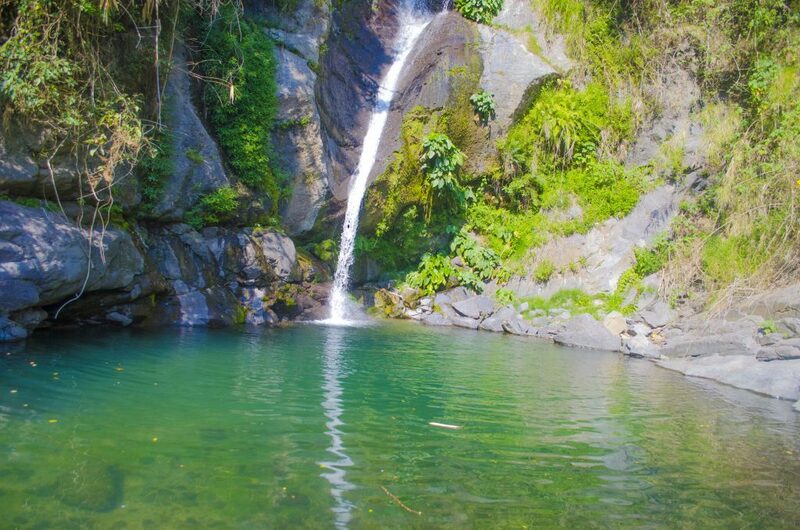 Bayokbok falls is a hidden gem that is slowly gaining popularity in Benguet. Thanks to Ms Gina Lopez, this falls is slowly unraveling its beauty to the ecotourism world. Bayokbok falls is actually a three-layered cascade. Only the first and second falls, however, are readily visible upon reaching the site. The first layer cascades on a sideward manner. It carved a very deep, wide, and long pool. During good weather conditions, Bayokbok falls casts a crystal-clear view of its waters. To get to the third falls, one needs to climb over the first and second. The third falls also has a deep pool, sandwhiched on bare rock cliffs. These cliffs provide a good diving or jumping platform. This is one of the tourist spots in Benguet which are eyed for ecotourism. The first cascade of Bayokbok Falls. 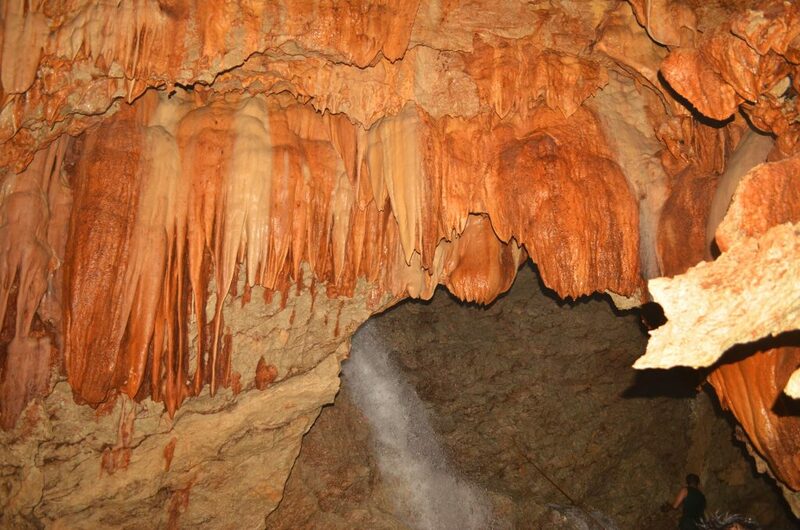 Aran Cave is a rapidly gaining popularity among locals residing in Baguio City and La Trinidad. It is just more or less an hour of drive away from these urban centers. The cave is named after a giant called Aran. Locals say that he used to dwell in the area and was responsible for the disappearance of workers during the construction Kennon Road. 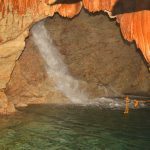 Inside the cave, one can find at least three waterfalls cascading on pristine pools. The waters of these are icy-cold and crystal-clear. Various stalactite and stalagmite rock formations also abound. There are actually three caves in the area, however, the other two are still undergoing assessment. A waterfall can also be discovered for a separate fee. It takes more or less two hours to get there. Rock formations and the third falls inside Aran Cave. This is just some 40 minutes’ drive from La Trinidad. Recently, the local officials have been improving the site to cater to the growing number of visitors. The hot springs emanate from rock crevices and directly flow towards the Tuel River. Hoses have been installed to channel the steamy waters on man-made pools. Isn’t it fun? You get to first warm yourself on the springs’ thermal waters. Later on, you can have a chilly bath or swim on the river. Further upstream, you can find stunning white rock formations. Oh, I used one of these to jump over a deep pool of Tuel River. By the way, the barangay collects an environmental fee of 20 pesos. There are also existing cottages along the hot spring. Each can be rented for 250 pesos. Other existing amenities are stores and an inn for those who would like to stay overnight. Posing by the steamy waters of Asin Hot Spring. 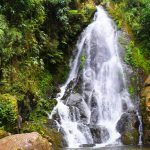 Shamsham falls is perhaps the highest falls in Tublay and one of the least known tourist spots in Benguet. There are actually at least three waterfalls composing Shamsham. 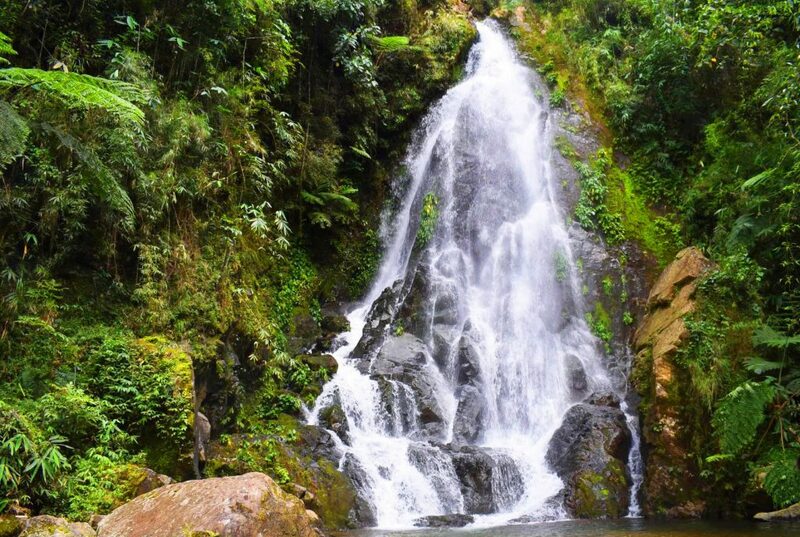 However, the main waterfall is most frequented by the locals for recreational activities. It measures more than 60 feet high and cascades on a small and shallow pool. To get here, one needs to hike for more or less an hour from the community proper. You will be passing across dense forests and wade across pools before finally catching sight of the main Shamsham falls. During our visit, I noticed the presence of tadpoles and small fishes, signifying that the waters of Shamsham are still healthy. Hopefully, this status will be sustained not only for the aquatic species but also for sustainable growth of tourism in the area. The main cascade of Shamsham Falls. Mt. Pokgong is a tri-boundary mountain between Sablan, Kapangan, and Tublay. This means, there are at least three major jump-off points to reach the pinnacle of the mountain. While atop, one can glimpse of the low-lying plains of La Union including the South China Sea. The neighboring mountains of La Trinidad, Tubaly, Atok, and Kapangan are also visible here. Mt. Pokgong and its adjacent ridges still host a few remaining pockets of forests. These shelter endangered species such as civet cats, monkeys, and various species of birds. Hopefully, the locals will take care of these since they can be a come-on for boosting ecotourism and community-based development. Mt. Pokgong as viewed from Bagong, Sablan. Mt. 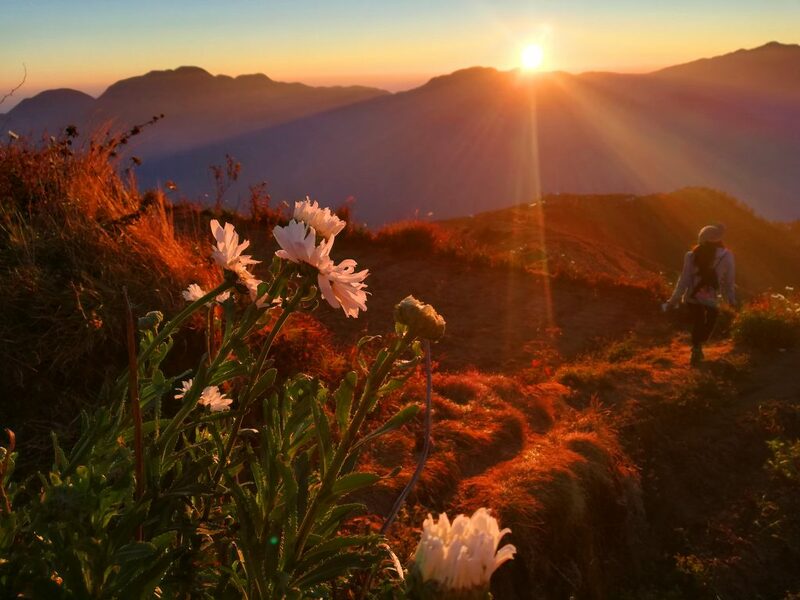 Amanayaw soars to more than 2000 MASL, making it one of the highest peaks in Kibungan, Benguet. Only a few trees and shrubs grow on its summit, thus, it offers a good view of the surrounding mountains, rivers, and other landscapes. On the other hand, mossy forests cover its lower slopes. These feed several brooks and creeks leading to the Amburayan River. Endemic species like cloud rat and civet cat consider these forests home. The trail to Mt. Amanayaw, however, is not yet fully established. From the road, it takes more than five to six hours of hike to reach sitio Tableu of barangay Badeo. This is the jump-off point. From here, it takes another hour of hike to reach Mt. Amanayaw’s pinnacle. Seems tough? Don’t worry. You will be rewarded with beautiful sceneries along the way. A partial view of the lower landscape of Mt. Amanayaw. The landscape of barangay Tacadang, Kibungan resembles the Grand Canyon of United States. Sheer and bare rock cliffs and formations dominate its entire landscape. That is why, it is also popularly known as the “Switzerland of Benguet.” Today, Tacadang continues to attract flocks of mountaineers and adventurers. It has several peaks for such activities. During rainy months, numerous waterfalls surround Tacadang in almost every direction. Some falls measure up to more than 500 meters high. Stunning rice terraces can also be seen amidst dramatic rock cliffs. Take note. It takes more or less a day of hike to reach the community proper of Tacadang. From there, you can proceed to locally-identified tourists’ attractions. Tacadang’s Rocky Wall of Beauties. Mt. 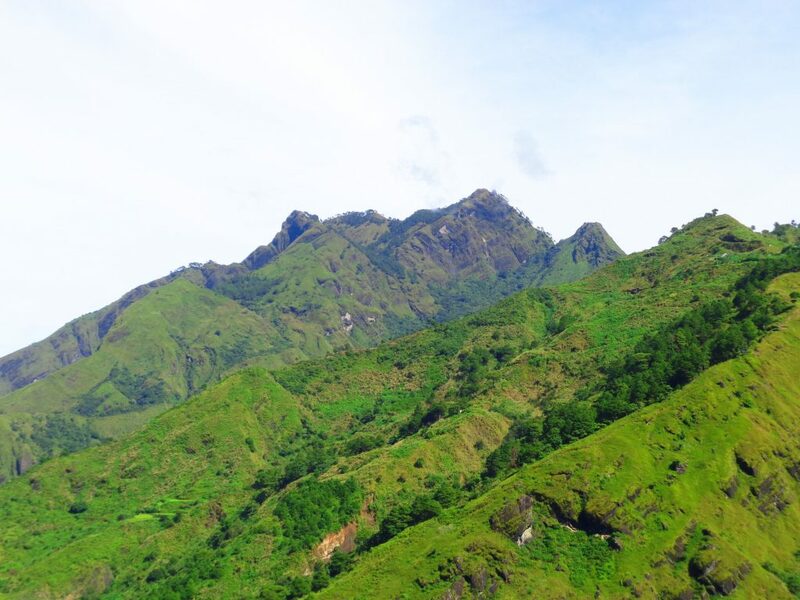 Tenglawan is one of the most frequented peaks of Bakun, Benguet. It is part of the Bakun-trilogy/trio. The other two mountains are Mt. Kabunian and Mt. Lobo. Mt. Tenglawan is visible from barangay Poblacion. Its partially forested slopes feed the brook leading to the Tres Marias Falls. While atop Mt. Tenglawan, you will catch sight of stunning mountain views and the lowland plains of La Union. Getting there, however, is no easy. Expect that you will be trailing on steep ravines, and uphill slopes. At some point, the trail is just inches away from sheer rock cliffs. Any wrong or reckless move could lead to your downfall. However, you’ll be safe so long as you take caution. Besides, the sceneries all along the way are simply breathtaking. 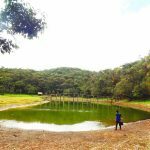 Badi is a fast-growing ecotourism destination in Kapangan, Benguet. It is a series of waterfalls. The highest of which measures more than 30 meters high. Some of these falls carved deep pools, fit for swimming. 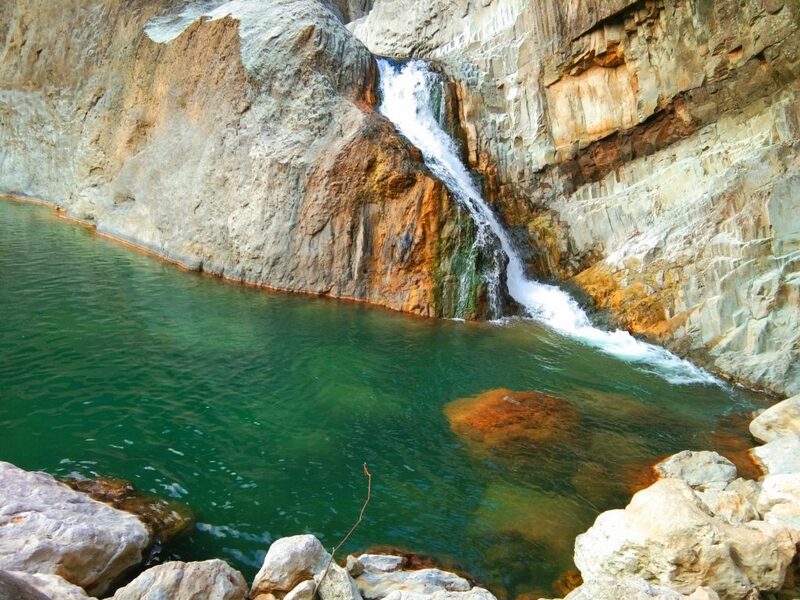 Badi falls’ cold and crystal-clear waters offer enlivening effect, after the hours of trek to get here. Yes, the trek may be long and winding. But, the trail offer fascinating views of lush forests and verdant mountains. Plus, you’ll get to hear the sweet humming or birds and the constant songs of circadas. 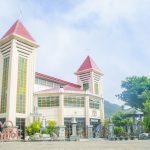 Mt Kompol-kompol is the ultimate destination for the so-called Mt. Purgatory Traverse. The traverse commences from Japas jump-off going to Mt. Pack. From Mt. Pack, it takes 2.5 kilometers to reach a viewpoint called Mt. Purgatory. It is named as such, owing to the cold and forbidding weather, reminiscent of a purgatory. From here, you will then trail on seemingly-endless mossy forests until you reach Mt. Kompol-kompol. This same mountain hosts a rich diversity of plant and wildlife species. Since time immemorial, it provided the locals with meat and medicines. Hunting used to be a major activity. Now, the mountain offers an opportunity for the locals to earn through ecotourism-based activities. Bengaongao and Paterno compose the cave systems of barangay Ambongdolan in Tublay, Benguet. 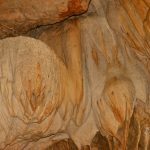 Personally, these are among the most beautiful caves I’ve ever visited. 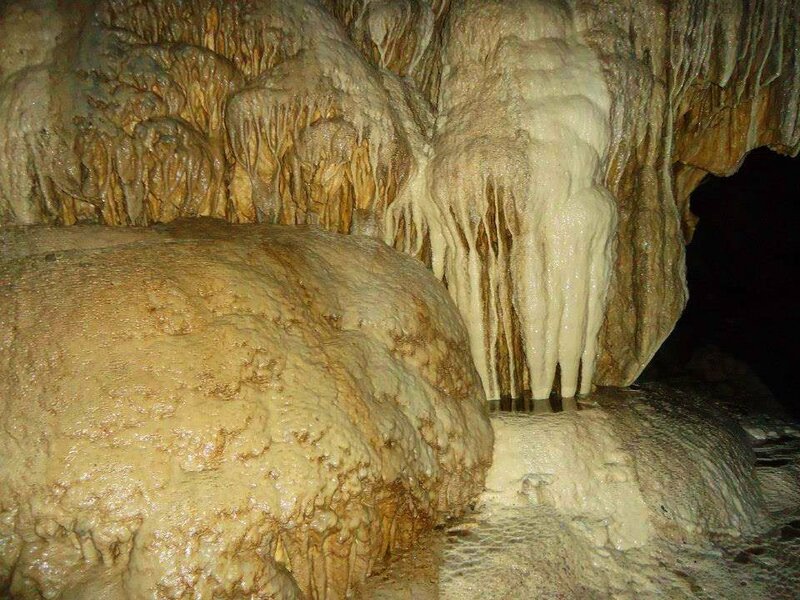 Here, you can find bizarre and exquisite stalactite and stalagmite rock formations. Bengaongao cave is the more popular one. It has a wide opening, surrounded with big boulders. Navigating your way here is quite easy as there are not so much diversions. On the other hand, you need to squeeze yourself and rappel down to get inside Paternon Cave. It is relatively drier compared to Bengaongao cave. After exploring these caves, you can sidetrip to a beautiful pool below. White rocks give an imposing view of this pool. It offers a rejuvenating bath or swim after the cave spelunking. By the way, you would need to pay 225 pesos at the barangay hall. These already cover the fees for tour guide, environmental, and barangay. 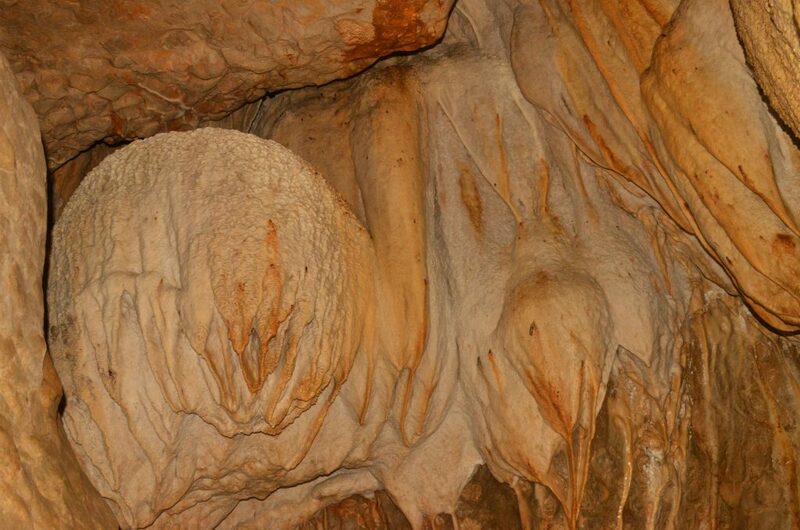 One of the rock formations found inside Bengaongao Cave. Along with Mt. Pulag, Mt. 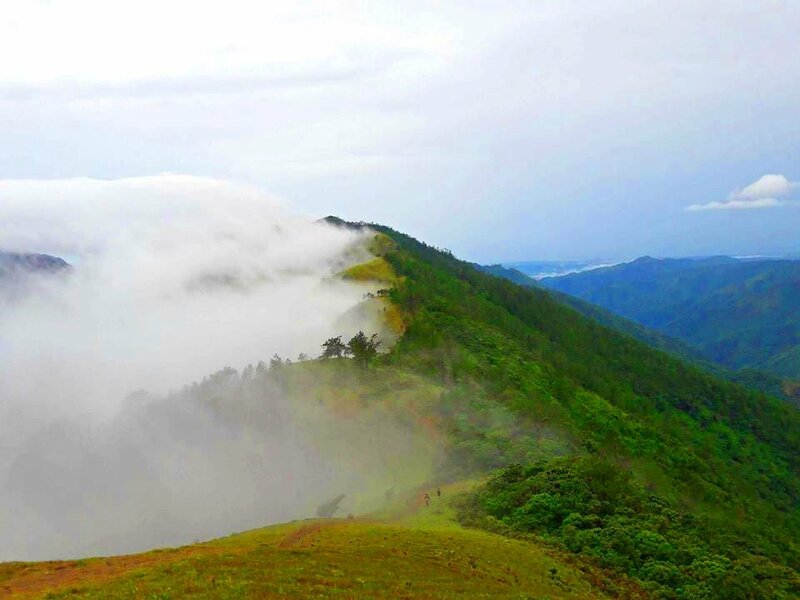 Ulap fares as one of the most popular hiking destinations in the Cordillera. Unlike Mt. Pulag, the trails going to Mt. Ulap’s summit are mostly lined with pine forest stands. There are actually two major jump-off points going to the mountain. The first one commences from somewhere in Nueva Vizcaya. The second and more popular trail starts from barangay Sante Fe of Itogon. Take note. Mt. Ulap is part of the ancestral domains of Itogon. The peak of Mt. 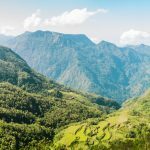 Ulap provides fascinating views of Cordillera’s mountain ranges and even the southern plains dominated by Mt. Arayat. After assaulting the summit, hikers or travelers can sidetrip to nearby sights such as burial caves. 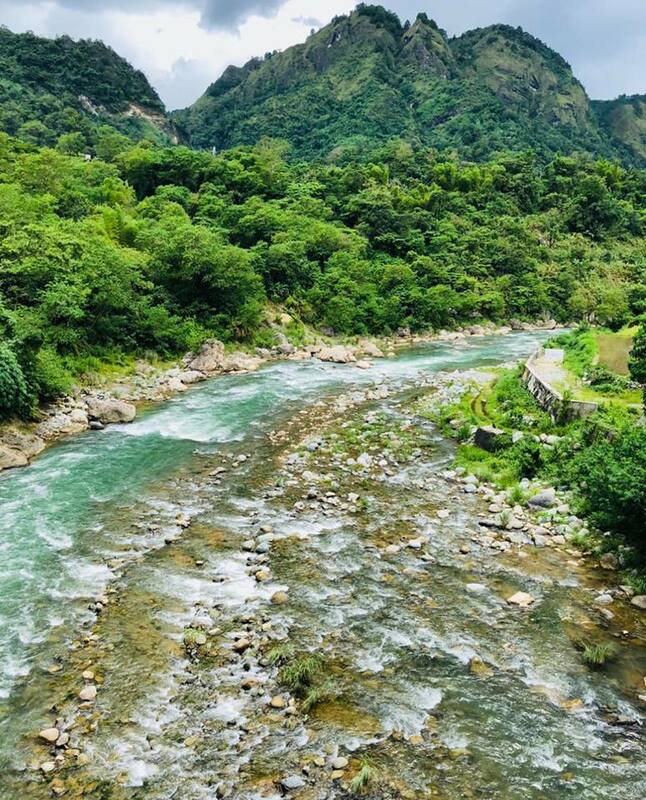 Amburayan River emanates from the towering mountains of Atok, Benguet including brook tributaries from Tublay. The river plays an important historical and cultural role among the local communities. It also provides irrigation to rice paddies all year round, thus, sustaining the main subsistence of the people. Its waters also teem with various marine species such as fishes, crabs, and eels. If properly marketed and sustainably managed, this can potentially attract nature lovers. Its rapids are also fit for whitewater rafting. Sadly, Amburayan River continues to face threat. Hopefully, the communities and local officials would enforce strict measures to protect and sustain the beauty and bounty of Amburayan River. 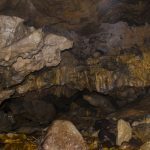 Longog cave is just one of the several caves found in Kapangan, Benguet. It is also one of the most accessible. It takes just over 20 minutes of hike from the road to reach the cave’s entrance. Unlike most of the country’s popular caves, the entrance to Longog cave is small and narrow. At some point, you will need to crawl on your belly to get across. You also need to hang unto rock openings and crevices to get deeper. Certainly, these present difficulties. However, you will then be rewarded with a stunning view of the cave’s inside chambers. Several pools can be found. Stalactite and stalagmite formations are everywhere. Some of the formations even contain glistening crystals. Inside the chambers of Longog Cave. Mt. Tabayoc is the second highest mountain in Luzon, just after neighboring Mt. Pulag. 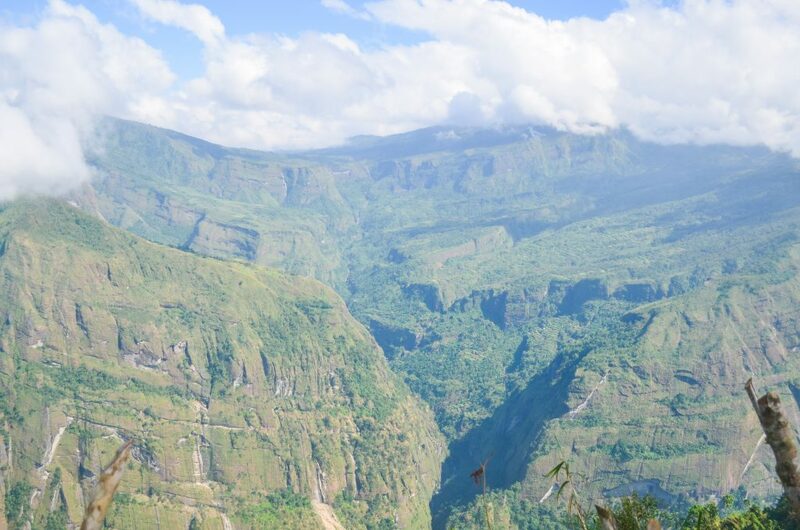 It rises to more than 2,842 MASL, making it the fifth highest in the entire country. Despite its majestic height, the usual jump-off point at Lake Tabeo is already at 2, 202 MASL. However, the trail to the summit is no easy one. In fact, some hikers often describe it as the “Monkey Trail.” Literally, you would need to hang unto vines and crawl on boulders on some parts of the trail. The surrounding forests are also dense and pristine. Unlike Mt. Pulag, the summit of Mt. Tabayoc is almost entirely covered in mossy forests. Fortunately, a viewing platform has been constructed. In addition, Mt. 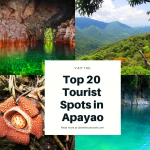 Tabayoc is an ecological paradise. 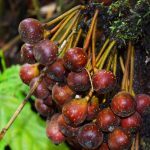 Its forests teem with rare and endangered species such as tree ferns, orchids, and various birds. 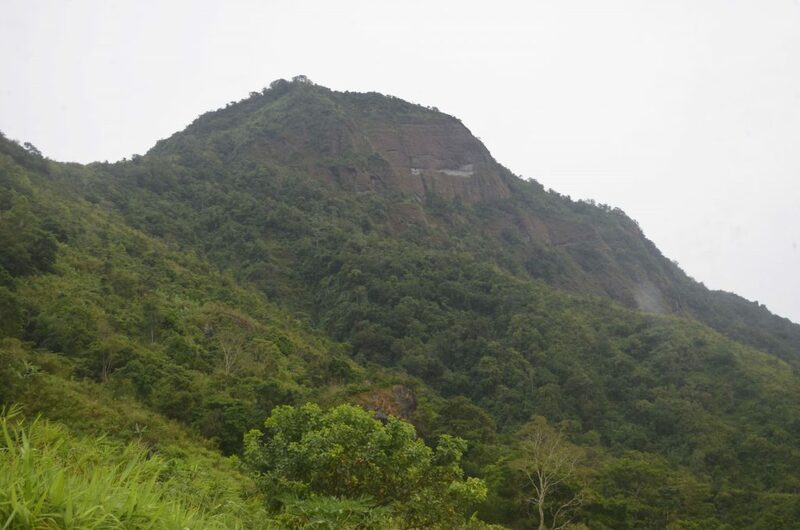 Mt Timbak stands prominently along the Halsema Highway. 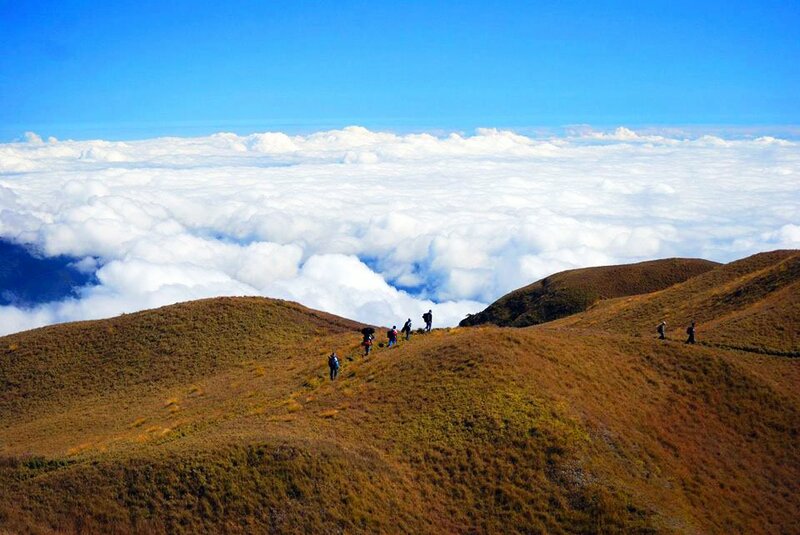 It is the third highest mountain in Luzon and the ninth highest in the Philippines. That is according to Pinoy Mountaineer blog. It rises to more than 2,717 MASL. 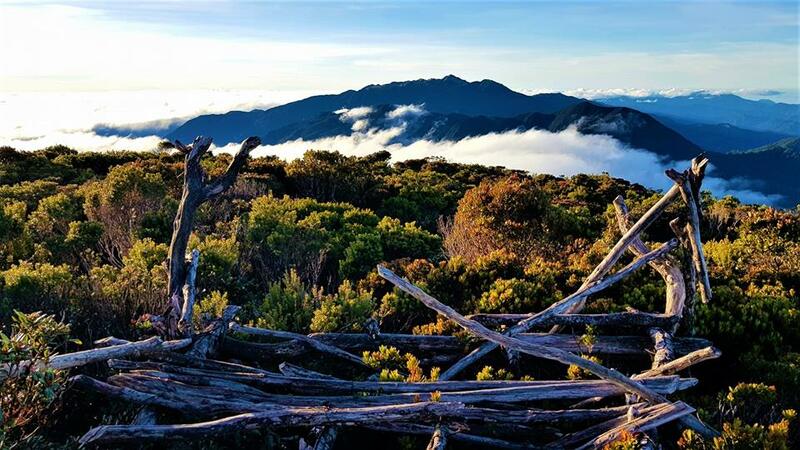 Unlike most major mountains in the country, Mt Timbak is very much accessible. A local road heads straight almost to the summit. This makes the trek pretty much more convenient and easier. The summit has been turned into vegetable gardens. Thus, one can easily catch sight of the surrounding mountains. The equally-majestic Mt. Pulag and Mt. Tabayoc are visible here. From the Halsema Highway alighting point, it takes just around an hour or two to reach the peak. An imposing view of the mountain can be seen from The Highest Point. Today, this is one of the most famous tourist spots in Benguet. Stunning sunrise view from Mt. TImbak. 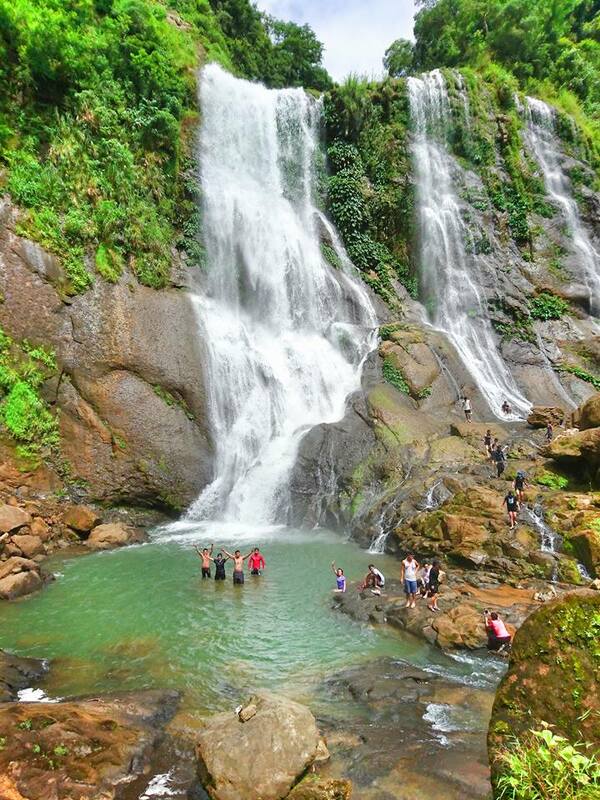 Payogpog falls is among the four locally-known cascades found in barangay Shilan. It measures around 30 feet high and cascades on a small and shallow catch basin. This is a good spot for swimming, picnic, and other recreational activities. To get here, one needs to hike for about an hour from where the barangay road ends. One will be passing across vegetable farms, and crossing creeks and brooks before finally reaching the falls. The best time to visit is during the rainy months. During these times, Payogpog falls appears in its full strength and beauty. Because of the untamed trail, any newbie needs to secure a guide before visiting the falls. 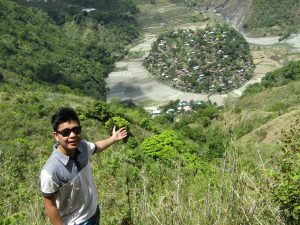 This nearby tourist spot in Benguet deserves a view indeed. Payogpog falls of Shilan, La Trinidad. 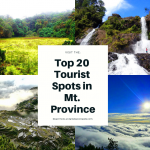 Top 20 Must-See Tourist Spots in Mountain Province. 1) Mt. Purgatory in Bokod, Benguet. Ada pay met 4 lakes idjay kabayan…tabeyo lake,ambulalakao lake detep ngepos lake and inkulos lake…. 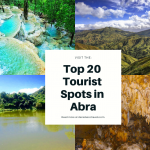 Thank you for featuring some of our touerist spots here in Bakun. We have more falls namely: Tres Marias Falls, Mangta Falla, Pikaw falls; Mountains namely: Mt. Lobo, and Mt. Kabunian; and Nagasa Cave.